This four-star hotel is ideally located on the seafront of one of the most beautiful and famous beaches of the island, Platis Gialos. Kosmoplaz Beach Hotel is within reach of the town, Chora, and many other stunning beaches. Bill & Coo is home to 30 beautifully styled suites that will make you feel right at home. Situated conveniently over the Megali Ammos Bay and just a stones’ throw away from Mykonos Town, Bill & Coo will remind you why exactly five-star luxury is so in demand right now. Lying snugly within a cliffside in Mykonos Town is CAVOTAGOO. Guests are welcomed to enjoy privacy within one of their suites and villas available, all of which feature sleek interiors and a private pool overlooking the beautiful Aegean Sea. Grace Mykonos is an exclusive hotel located just North of Mykonos town and is open for select dates throughout the year. Providing glorious sea views and enchanting rooms with elegant touches, this hotel truly represents Mykonos accommodation at its very best. 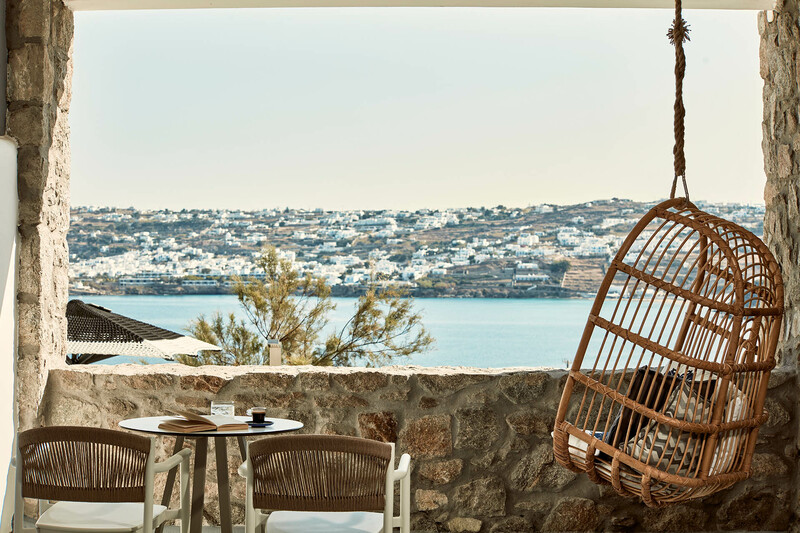 Absolut Mykonos is a family run hotel that lives and breathes hospitality. All of Absolut’s suites come fully equipped with a Nespresso Coffee Machine, 32″ Flat Screen TV, a mini fridge that can be filled prior to your arrival by choosing one of their mini-fridge booster packages, modern furniture, premium linen, and more! Tucked away in a hillside in Kanalia village lies Mykonos No5 Villas & Suites. You will be spoilt by the gorgeous surroundings, the tranquillity and luxury provided. This hotel promises to give you flawless accommodation with luxury and comfort at its very finest. 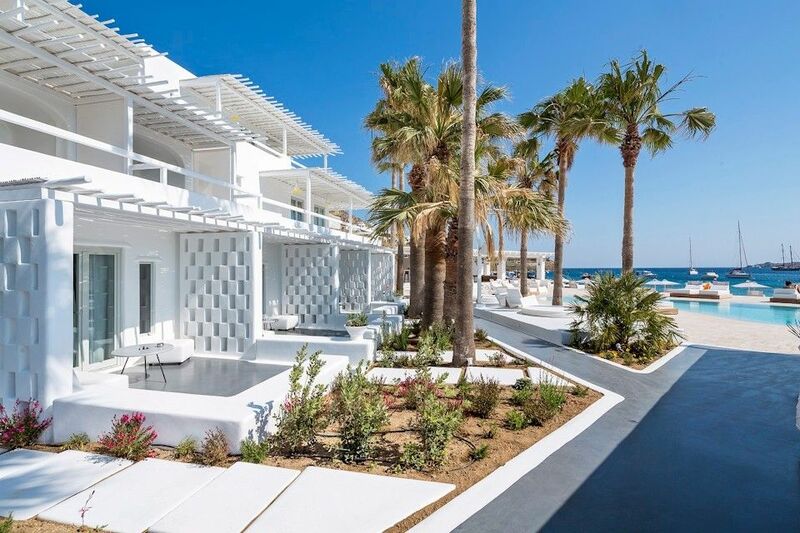 This five-star beachfront hotel features pure white-on-white interiors and the architecture is kept to a minimal style. This soft white interior makes the true blue of the Aegean Sea really pop, making this hotel the perfect holiday canvas. The Myconian Imperial Resort is popular with honeymooners and couples that seek laid-back luxury in a beautiful and natural setting. The hotel is just moments away from the nightlife and provides a complimentary shuttle to get you there. The staff at this hotel are friendly and take into consideration the comfort and well-being of each guest that arrives there. 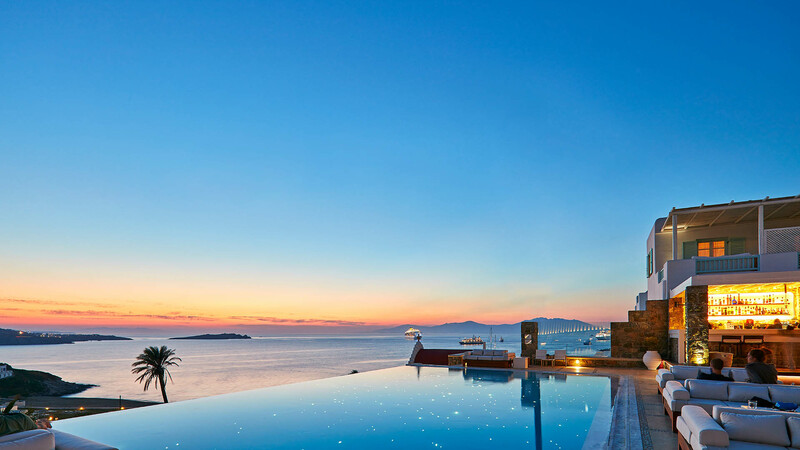 San Marco Hotel & Villas is located on the stunning Houlakia Bay on the North West Coast of Mykonos and is perfect for people that are looking to enjoy the gorgeous sunsets. Guests can enjoy the luxury of a sea-view villa too available at the hotel. Nothing will be as perfect as being able to enjoy the Mykonos sunset from the terrace of your Mykonian Mare luxury suite. This stunning hotel takes full advantage of the breathtaking views and offers a treat to the eyes from every suite.